Today we’re hosting The Giants’ Shoulders, a monthly event providing a taster of some of the best history of science the blogosphere has offered this month. News of a meteor breaking up over Russia and the close approach of an asteroid inspired many bloggers including Rupert Baker at the Royal Society Repository, Darin Hayton, Lisa Smith at the Sloane Letters Blog and Greg Good at Geocosmohistory. On the Board of Longitude Project blog, Alexi Baker surveyed how attitudes to inanimate objects such as meteorites have been affected by changing beliefs and the status of the person or technology mediating them. 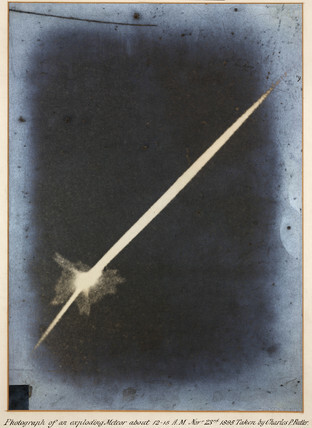 An exploding meteor, 23 November 1895, by Charles Prichard Butler (Science Museum). As the horse meat scandal rumbled on, Mary Karmelek uncovered some 19th century Scientific American articles advocating dining on Dobbin. Historians at the University of Manchester provided the Crufts dog show judges with a precedent: a pointer called Major. More exotic creatures featured in My Albion, which traced the development of illuminations of the bonnacon and elephant, and National Geographic, where Brian Switek explored how crocodiles and tortoises were recruited in 19th century studies of Chirotherium tracks. Several bloggers, including Teal Matrz at the Royal Society and David Bressan at Scientific American, tied in with International Women’s Day. While women have a much greater presence in the sciences than they did at the time of this Nature article uncovered by John Ptak, Christie Aschwanden and Ann Finkbeiner argued that profile authors need to stop defining female scientists by their gender. Anniversaries abounded. Frank James celebrated the bicentenary of Michael Faraday’s appointment to the Royal Institution. For the bicentenary of John Snow’s birth, the Wellcome Trust displayed his famous cholera map, while the Guardian recreated it for today’s London and Richard Barnett at the Sick City Project revealed the man behind the hero myths. 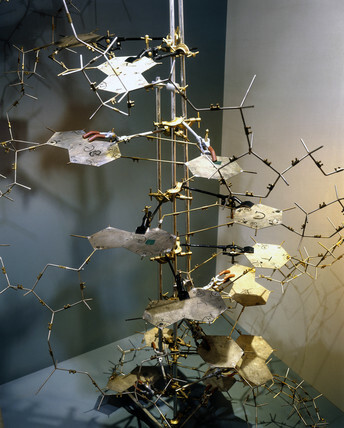 There was more myth-busting at Genotopia, skewering some of the stories that have been built up in the 60 years since the discovery of the DNA double helix. Finally, for St. Patrick’s Day, a quick roundup of some blogs on subjects with Irish links. On The H Word Rebekah Higgitt explored Jonathan Swift’s satirical attacks on the Royal Society and Isaac Newton, while Collette Kinsella highlighted the often-overlooked John Tyndall. Unfortunately for the 17 March souvenir trade, Mary Mulvihill revealed on Ingenious Ireland that there’s no such thing as shamrock. Next month’s Giants’ Shoulders will be hosted by Mike Finn and Jen Wallis at Asylum Science Blog on 16 April. In the meantime, you’ll find links to plenty more blogs I didn’t have space to mention at Whewell’s Ghost or on Twitter. Your link to Genotopia needs to be fixed. Thank you for this post, I appreciate your inclusion of more STS-type material in this edition of Giants’ Shoulders. Thanks for your comment – link now fixed.